Your lovely wife’s birthday comes but once a year. Make the most of this rare, special occasion by giving her a birthday wish that encompasses her beauty, strength, and charm. 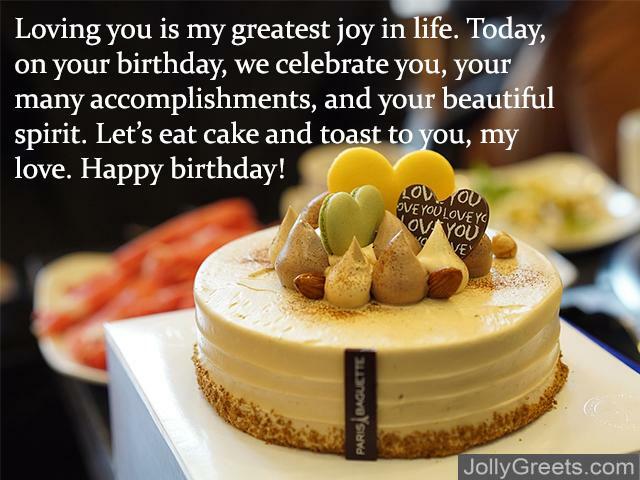 Whether you have been married for 3 years or for 30, this article contains birthday messages that will sweep her off of her feet. There’s no better time to let your wife know just how amazing she is than her birthday. With one of these romantic messages, she’ll spend the day feeling happy and loved. My beautiful wife, it makes me enormously happy to wish you a happy birthday today. I fall deeper and deeper in love with you every day, and I’m so lucky to be your husband. Happy birthday, my love! I would be lost without you, my endlessly beautiful wife. Today is your special day, but I want you to know that I will be here for you every single day, birthdays, anniversaries, holidays, and even just your ordinary Monday. Happy birthday, I love you. Loving you is my greatest joy in life. Today, on your birthday, we celebrate you, your many accomplishments, and your beautiful spirit. Let’s eat cake and toast to you, my love. Happy birthday! Being married to you means that every day is an adventure. Wherever we go, whatever may happen, it will all be okay so long as I’m with you. Happy birthday, my gorgeous wife, I love you so much. Every moment I spend with you takes my breath away. Your birthday is today, and I hope it’s at least a fraction as special as you are to me. I love you, my amazing wife, here’s to a year of joy, happiness, and excitement. Happy birthday! You, my dear, are simply exceptional. Not only are you an incomparable wife, but also an incredible mother. Our family is the greatest blessing of my life. Today, we celebrate you and the wonderful year that lies ahead. Happy birthday, I love you. My beautiful wife, the mother of my darling children, I love you so much. Happy, happy birthday, let’s celebrate how wonderful you are! You have not only made an immeasurable impact on my life, but also on the lives of our beautiful children. There are no words in the English language that could adequately express my love for you. As a wife, as a mother, you are beyond compare. Happy birthday, I love you so much. A 60th birthday is a very special day, and as your husband, I can’t wait to celebrate with you. Let’s make this birthday the best one yet! Happy birthday, I love you. 60 years of ups and downs, laughter and tears, love and heartache. Life has many seasons, but when it comes to you, the good always outweighs the bad. Happy birthday to the most incredible woman I could ever hope to love and call my wife. Having you by my side for all of these years has been a blessing and a joy. On your birthday today, we look back fondly on the years behind us and anticipate the wonderful years that are yet to come. Happy 60th birthday, my beautiful wife, I love you! Happy birthday to my beautiful wife; I love you more than you know. Without you, I would be nothing. Happy birthday, my gorgeous wife, I love you so much. My beautiful wife, I hope your birthday is as wonderful as you are. I love you. Birthdays are for love, laughter, cake, and presents. Let’s check all of those off the list today. Happy birthday, my lovely wife, you mean the world to me. Your birthday doesn’t come around everyday, so I’m taking this opportunity to tell you that you’re the most special woman in my life, and always will be. Happy birthday, I love you! My love for you is as boundless as the sea. Happy birthday, my beloved wife. I loved you yesterday, I love you now, I’ll love you tomorrow–I’ll never stop loving you. Happy birthday to the most beautiful wife I could ever hope for. My darling wife, today you turn 45. With every year I spend with you, my world becomes brighter, more beautiful, more full of life. Here’s to a fantastic year of love and joy ahead. Happy birthday, darling, I am so in love with you. It’s not every day that you turn 45! My dear, I know you sometimes wish that we were 25 again, back to our years of youth and endless possibilities. But the truth is, you are as full of life and spirit as the day we met. In fact, you grow more beautiful to me with each passing day. Happy birthday, I love you! For 45 years, you have been bringing light and joy to the lives of those around you. As your husband, I’ve been so lucky to be by your side through all of it, to grow with you, to love you. Happy birthday, my exceptional wife, here’s to you and everything that lies ahead. With one of the lovely, sincere wishes listed above, your wife will feel the love and appreciation she deserves on her birthday.